I love Halloween! And I used to love to play Tic-Tac-Toe when I was a little girl. So I combined the two to create a Halloween Tic-Tac-Toe! It’s even magnetized, so it could be played in the car. 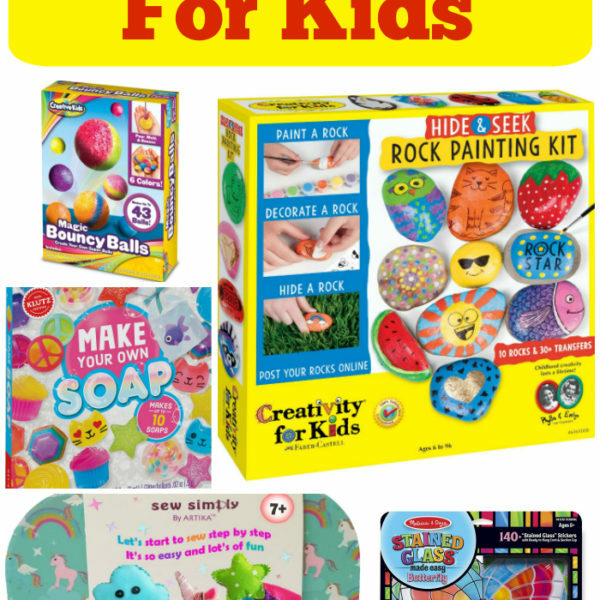 The elements and the papers in the kits are darling! 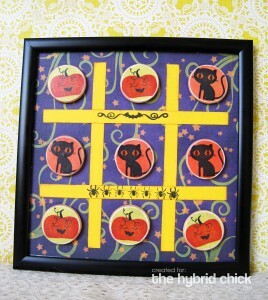 Kids (and adults, too) will enjoy playing Tic-Tac-Toe with these cute pumpkin and cat images. I think I did this the old fashioned way, but here goes! I first printed the green and orange papers. 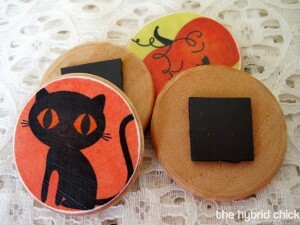 Then, I sized the pumpkin and cat images to approximately 1.25 inches and printed them onto the colored papers. You’ll need at least 5 of each image. 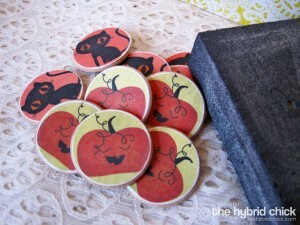 I used my cuttlebug and 1.5 inch circle die to cut out each image. I glued them to the wood discs with liquid glue. Next, I sanded the edges of the paper circles. This is optional, but I like the look! While they were drying, I printed the purple patterned paper and cut it to fit the frame. I also cut the yellow cardstock into four 1/2 inch x 7 inch strips and glued them in place. 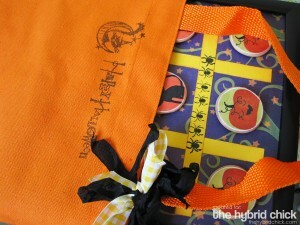 Then decorated with Halloween stamps. When the discs were dry, I added a magnet to the back of each one. Now for the hardest part, cutting the metal sheet to size. It’s not really THAT hard, but it’s not super easy either. 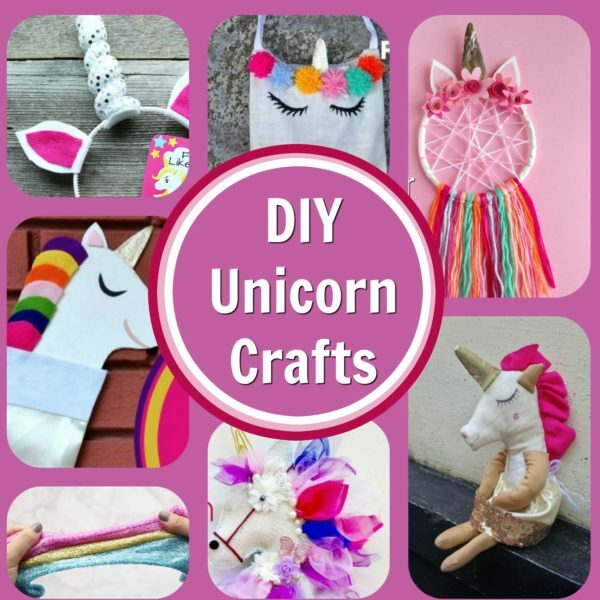 I believe that some home stores will cut it for you and that may be the best. 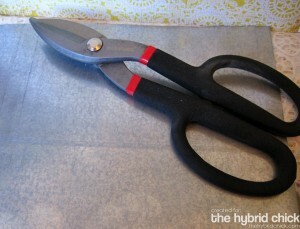 If not, they sell some HUGE shears that cut through the metal sheet. After cutting it to size, I enclosed the edges in clear tape which helps you keep from cutting yourself when handling the metal sheet. Now it’s time to put the Tic-Tac-Toe together. Take the glass out of the frame. Put in the Tic-Tac-Toe board you made, then the metal sheet, maybe a piece of chipboard to make it nice and snug and then put the back back on. You’ve done it! I bought an orange bag to use to store it. No closure is necessary because the pieces are magnetized and stay right on the board. 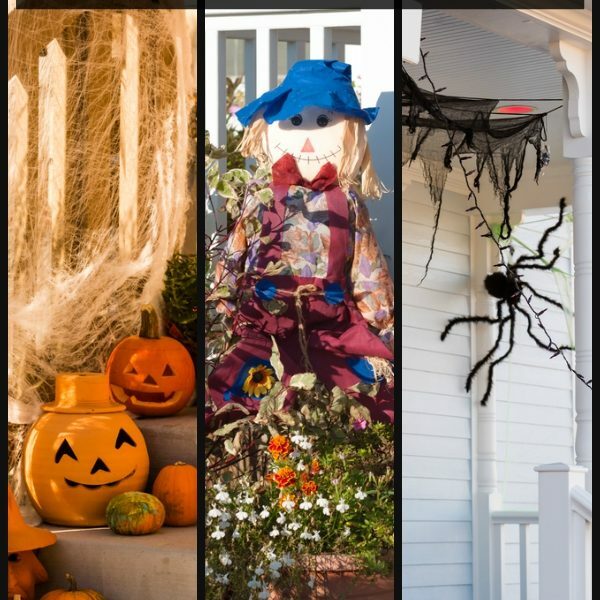 Now you’ve got a cute Halloween Tic-Tac-Toe for your family to enjoy!